While chocolate, and of course, peanut butter, rule my baked goods world, second to those two would be making treats with citrus. Lemons, oranges, limes or what-have-you - I'm a sucker for them. 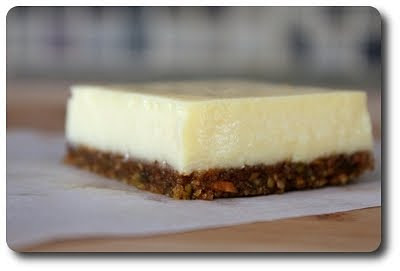 With that in mind, our next foray into the Wednesday Treat Day for Jeff's co-workers this new year were these cool, clean and refreshing Lime Squares with Pistachio Graham-Cracker Crust. To get the crumbs needed for the graham cracker crust, we used about 4 ounces or 114 grams - I'm not sure how many rectangles that was, but you should be able to use the nutritional information on the package if you'd wish to just count out the rectangles and go. Graham crackers by themselves make a delightful crust, but to up the ante, a scoop of nutty pistachios joins the wheat-y cracker crumbs in the food processor to beat them down until they are finely ground. Make sure you do the crumbs and pistachios together - if you try to do the nuts by themselves, you may end up with pistachio paste, which would be quite tasty, but not what you are after - you are looking for tiny nuggets. As if pistachios weren't enough, few spoonfuls of granulated sugar, fresh grated lime zest and a pinch of salt were also added into the food processor when you ground the nuts and crackers together. 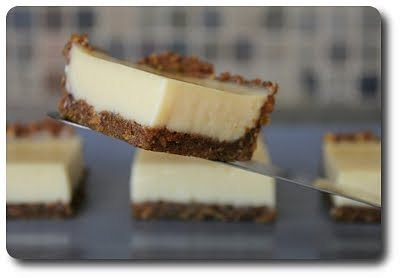 To bind those snazzy ingredients together, melted butter is blended in - the mixture shouldn't start to look clumpy as you are adding just enough moisture and fat to allow the crumbs and nuts to keep each other cozy. Patted into the pan to cover the bottom and a notch up the sides, the crust needs to bake naked to set, then allowed to cool completely while you work on the filling. The filling is ridiculously simple - egg yolks, sweetened condensed milk and fresh (yes, squeeze your own limes please!) lime juice. That's it! I do want to caution you to use the right milk - you need condensed milk, not evaporated. Sweetened condensed is milk that has had some of its water (about 60% or so) removed, with plenty of sugar added back in. Evaporated has the same water evaporated, but no sugar is added and it is a bit more processed. With the filling poured in and smoothed over, the pan goes back into the oven just long enough to set the lime topping and is then cooled completely at room temperature before being chilled for at least an hour before you dig in. If you've prepared the pan as we directed, cutting these into tidy squares won't be an issue. You've essentially created a sling using parchment paper and since the square has been chilled, it is solid enough to easily lift the whole slab out. For crisp edges, wipe your knife blade in between cuts. 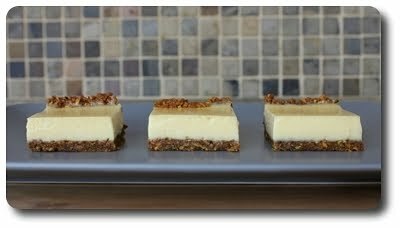 If you could imagine a creamy key lime pie and your favorite tart lemon bar got a little funky together, I think this is what you'd be left with. The filling was a slick contrast to the robust, crisp and thick crust it sits upon - we found it silky smooth and sweet, with each bite finishing with a welcomed tart 'tude. I did find it slightly egg-y, but not obnoxiously so - I may just be sensitive to that though as Jeff did not notice it. This recipe sounds amazing. Key lime anything will go over well here. That's a good looking lime bar sir! Thanks for sharing the recipe. Pics are great too. I'm a huge lemon/lime fan myself. These look good, and they remind me of something I make called "lemon squares". I wish I could send you the recipe since you love lemon and lime so much...it's a great recipe. 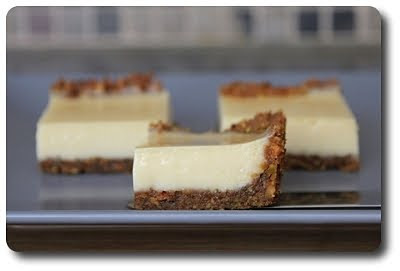 They are actually cheesecake squares, and you can easily substitute the lime for the lemon. Look delicious and I'd imagine very refreshing and zingy. These look amazing. 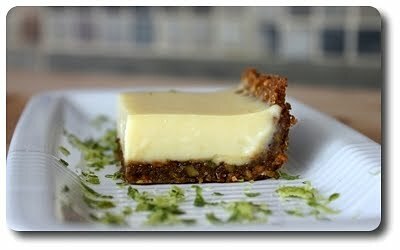 I love key lime, and the addition of pistachios just convinced me to add these to my "to do" list. These sounds like little bites of amazingness! Can't wait to make these! these look fabulously beautiful! i love lime and this dessert is right up my alley! Kelly - I hope you give the bars a try! Katie - Very much so! Michelle - The crust totally makes them! Laurel - They are definitely a snap to prepare, so no need to wait too long to try them! Really nice photos! For some reason they seem more pleasing to the eye than your regular white background??? Either way the bars look delish! I love the sound of this crust. It definitely sounds like it gives the bars an unusual twist. Yum! And darn, we just polished off our huge bag of pistachios! Will have to get some more and make this wonderful looking treat! I'm a diabetic but I try to adapt your recipes so I can enjoy them. So far it hasn't been too hard to do. I will try this one with just a few changes. Sure hope it comes out okay, then I can pass it along to my blog readers. I would love to see an Orange cake recipe that has an orange sauce that goes over it. Lost my recipe when I moved and so far can't find one like it. 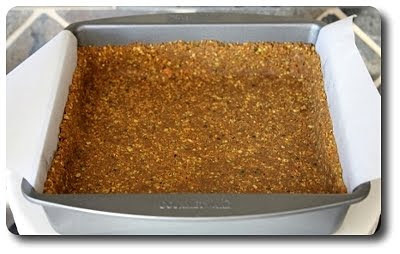 It is baked in an angel food pan. You poke holes with a toothpick in the cake then pour the sauce over it while still warm. I have put your Blog link on my blog so I can visit often.Anything made with citrus is top on my list. oh my goshhhh you have the same dessert weakness as i do! making this soon, i hope! Kelly - It definitely made the bars. Jan - Always good to have extra pistachios on hand! Shirley - Let us know how it turns out! First time but very glad I found your blog. So far I want to try more than half of what I've seen. I love citrus and these bars look perfect. Will visit again. Please feel free to do the same. And keep up the good work!